Russo-Polish rabbi and author; born in Kalvariya, government of Suwalki, Russian Poland, 1842; died in New York Aug. 1, 1887; son of the rabbi of Wizhajny, and a descendant of Yom-Ṭob Lipmann Heller of Prague. His youth was devoted to the study of the Talmud; and in 1862 he settled in Meretz, government of Wilna, where later on he embarked in business. The zealots of that city and business reverses rendered his life there unpleasant; and in consequence he removed to Kovno, where he soon found employment as tutor in the house of Ezekiel Jaffe. Later he became rabbi of Druskeniki, government of Grodno. In 1884 he emigrated to the United States and became rabbi of the Congregation Anshe-Kalvariya, New York. 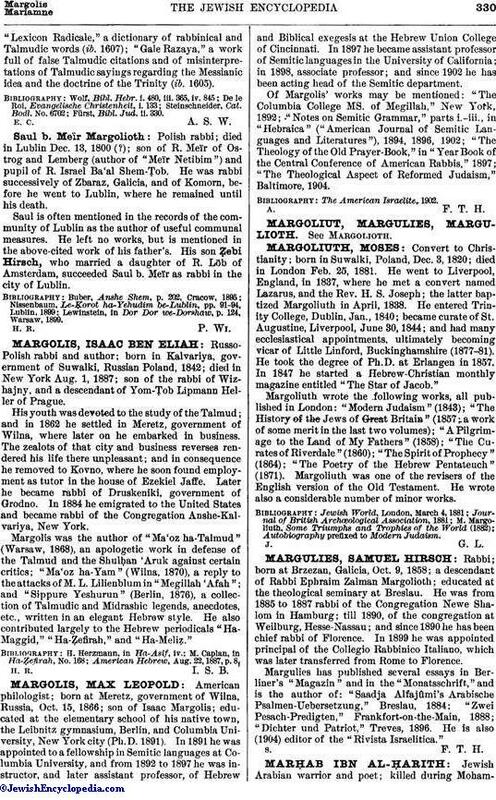 Margolis was the author of "Ma'oz ha-Talmud" (Warsaw, 1868), an apologetic work in defense of the Talmud and the Shulḥan 'Aruk against certain critics; "Ma'oz ha-Yam" (Wilna, 1870), a reply to the attacks of M. L. Lilienblum in "Megillah 'Afah"; and "Sippure Yeshurun" (Berlin, 1876), a collection of Talmudic and Midrashic legends, anecdotes, etc., written in an elegant Hebrew style. He also contributed largely to the Hebrew periodicals "Ha-Maggid," "Ha-Ẓefirah," and "Ha-Meliẓ." American Hebrew, Aug. 22, 1887, p. 8. H. R. I. S. B.